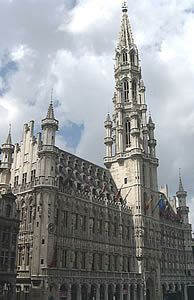 Brussels (called Bruxelles in French) is the capital city of Belgium. 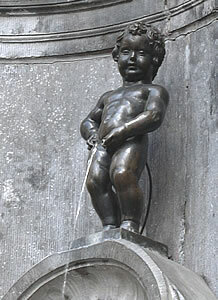 Originally called "le petit Julien" (French for "the young boy Julien"), this fountain is now commonly known as Manneken-Pis and is a very famous landmark in Brussels. 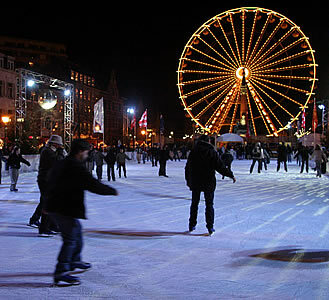 It is located on the Rue de l'Etuve (on the corner of Rue du Chêne), close to the Grand' Place. It is not known exactly why the statue was created, but there are many different legends. One is that the 5-year old son of a Belgian nobleman got lost in Brussels. His father desperately searched for him, but he couldn't be found anywhere. Eventually, two days after he went missing, he was found - at that time he was urinating. His father was very happy to get his boy back, so he paid for a fountain to be made showing the boy as he looked when he was found. Another story is that hundreds of years ago some enemy soldiers surrounded Brussels, placed barrels of gunpowder under the town walls, and lit the fuse. A local boy saw this and put out the burning fuse by urinating on it, saving the city. 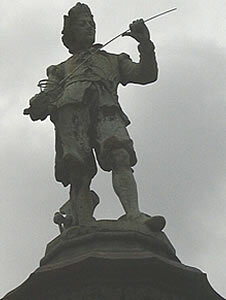 Over its 300 years of existence, it has become a popular tradition for clothes to be made for the statue. 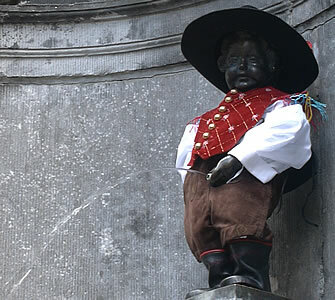 You can see many of these costumes in the Salle du Mannequin-Pis at the City Museum (Musée de la Ville de Bruxelles, Maison du Roi, Grand' Place). 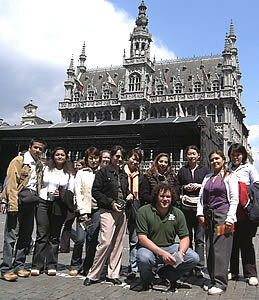 Grand' Place is the centre of Brussels and the most popular area for tourists. Many festivals take place here, the most famous of which are the Ommegang at the beginning of May and a festival in August in even-numbered years during which the square is covered in flowers whose colours create pictures of coats of arms. 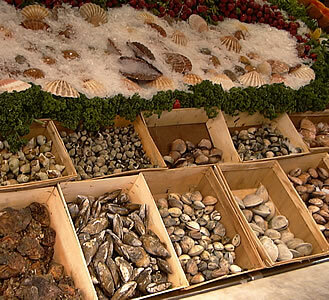 Trade organisations called guilds became established in Belgium in the 13th century and quickly became very rich. You can see the built impressive buildings which they constructed (guildhalls) around the marketplace. 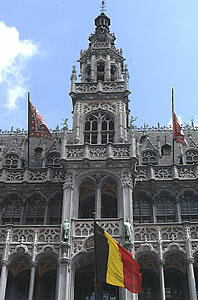 The tourist information centre for Brussels is located in the town hall (Hôtel de Ville). Ask for a street map and for a metro/tram/bus map (both are free). You may also want to check the opening times of any museums which you wish to visit. 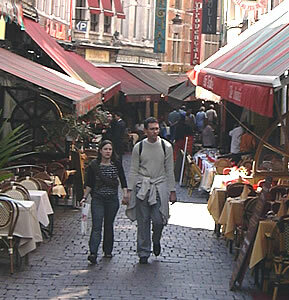 A short walk from the Grand' Place is Rue des Bouchers. 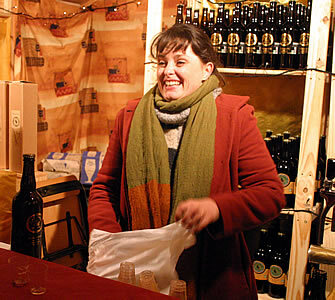 Here you can find many restaurants along the road, many serving traditional Belgian dishes. Off the middle of this road is a short passage called Impasse de la Fidelité. 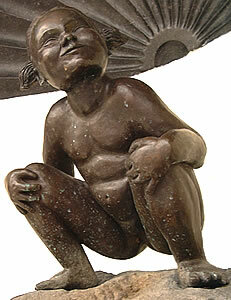 At the end of this you can see Janneke-Pis, the female equivalent of Manneken-Pis (created in 1987). You can throw a coin into the fountain (the money is collected and used for charity). 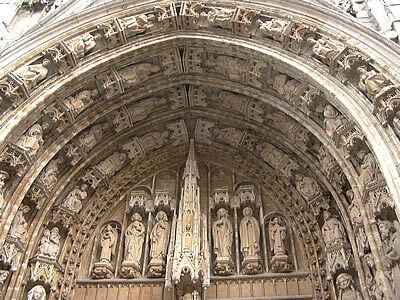 In Place Sainte-Gudule (Métro: Gare Centrale) is a magnificent cathedral in Gothic style, built between the 13th and 15th centuries. The interior is very beautiful. 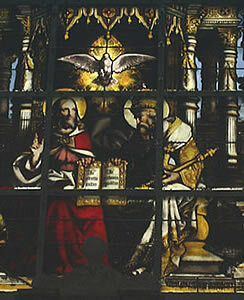 Two of the attractions are the stained glass windows and the pulpit, which has been carved from oak. 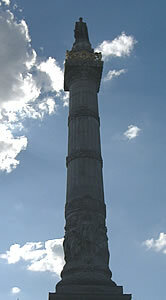 The Congress Column (Colonne du Congés; Métro: Botanique) was built between 1850 and 1859. 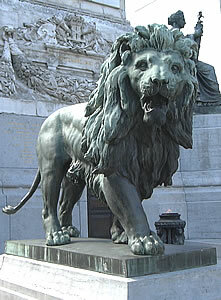 It commemorates the establishment of the Belgian constitution by the National Congress after the revolution of 1830. At the top is a statue of the king Leopold the First, and at the bottom is an eternal flame which honours the Unknown Soldier. Near the column is a famous chocolate shop called Mary (73 Rue Royale; Métro: Botanique). This shop holds a Belgian Royal Warrant. 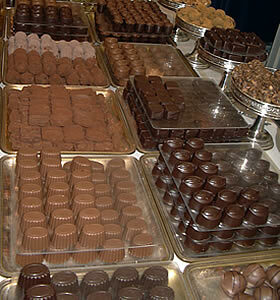 Their chocolates can be delivered worldwide (you can order from their website: http://www.marychoc.com). The Botanical Garden (Botanique; Métro: Botanique) contains some attractive gardens where you can sit down and rest for a while. The building is not used for plants now: it has become a French cultural centre. There is a museum called the Belgian Comic Strip Centre (Centre Belge de la Bande Dessinee) at 20 Rue des Sables (Métro: Botanique). 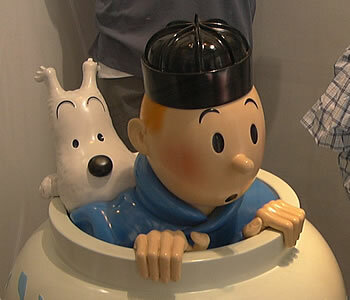 The most famous Belgian cartoon character is Tintin, created by Hergé (note that there is a shop specialising in Tintin near Grand' Place at 13 Rue de la Colline, Métro: Bourse). 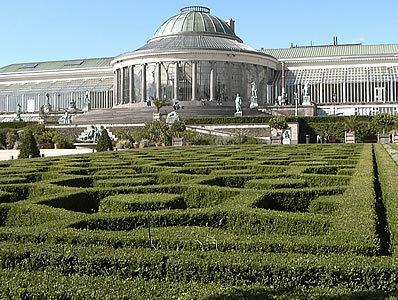 The Parc du Cinquantenaire is a few minutes' walk from the Metro station Schuman. 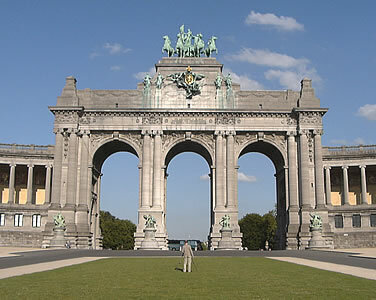 It was created to celebrate the first 50 years of the kingdom of Belgium (formed in 1830), although the arch in the middle was not completed until 1905. The statues of 8 women (4 on either side) each represent one of the 8 Belgian provinces. The buildings on both sides of the arch contain museums: the Royal Museums of Art and History (French: Musées Royaux d'Art et d'Histoire), Autoworld (containing veteran and vintage cars), and the Royal Museum of the Army and Military History (French: Musée Royal de l'Armee et d'Histoire Militaire). Brussels' own "Arc de Triomphe"
In the northern suburbs of Brussels, close to the Metro station Heysel, is the Atomium (102m tall). 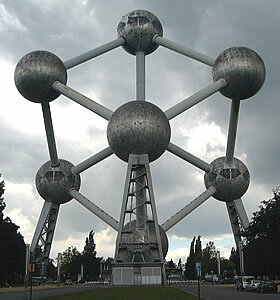 This was built for the International Exhibition of 1958, and is based on the structure of an atom of iron. There are 9 spheres, linked by stairs and escalators. Its design was influenced by the Belgian metal industry, the focus on the "atomic age" at the time, and possibly by the fact that there are 9 provinces in Belgium. There are exhibitions inside some of the spheres, and it is possible to climb to the top sphere for panoramic views of the city (there is a charge to go inside). 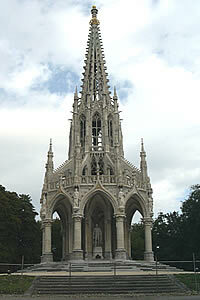 It has become one of the most famous symbols of Brussels. 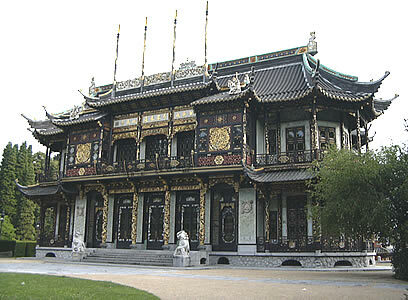 The Chinese Pavilion and Japanese Tower were built as an initiative by the Belgian king Leopold the Second between 1901 and 1909. They were designed by a Parisian architect called Alexandre Marcel. Inside the Chinese Pavilion is a collection of Chinese and Japanese china, European paintings and Chinese furniture. Inside the Japanese Tower (which is based on the style of a Buddhist pagoda) the decoration recreates the atmosphere of 19th century Japanese palaces and temples. 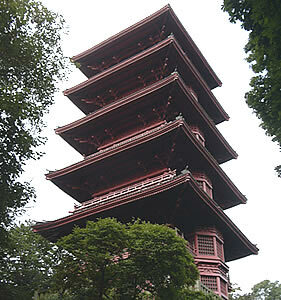 A short walk from the Chinese Pavilion and Japanese Tower is the Château Royal de Laeken. 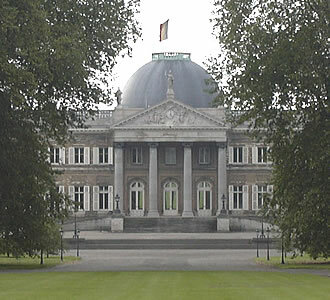 This is a Belgian royal palace, and is used as a home for the king or queen. 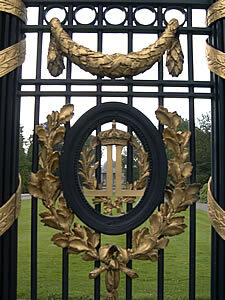 The public is not allowed to enter the palace grounds. On the opposite side of the road is a park and the Monument to Leopold the First, erected in 1878. 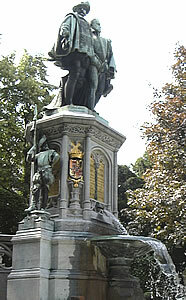 In the centre is a statue of Leopold the First, the first Belgian king. 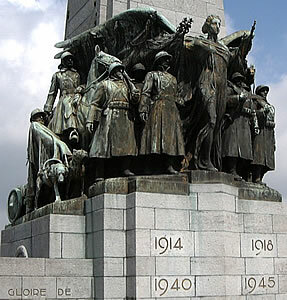 The 9 other statues around the outside represent the 9 provinces of Belgium. 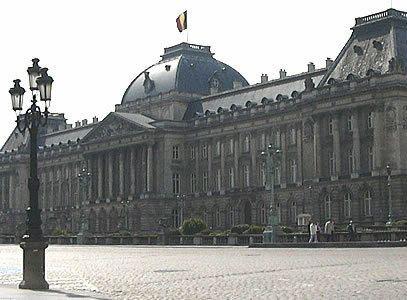 The Royal Palace (Palais Royal) is used by the Belgian king / queen for official occasions. The Belgian flag flies here when the king / queen is there. There is a changing of the guard ceremony here each afternoon. The palace, which is furnished in 19th century style, is usually open to the public from late July until the middle of September. 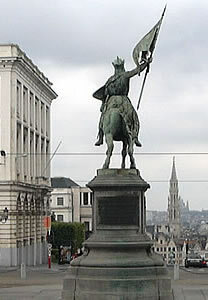 In the centre of the Place Royale is a statue of Godfrey de Bouillon on a horse, on his way to Jerusalem for the First Crusade. Behind this is a church called Eglise Saint-Jacques-sur-Coudenberg. The facade in front of this 18th-century church is based on the design of a Roman temple - the octagonal bell-tower was added during the 19th century. 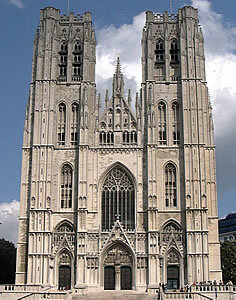 Members of the Belgian royalty sometimes attend church services here. 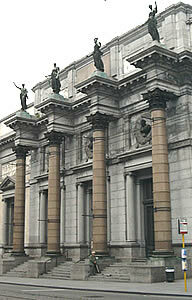 The Belgian Royal Museums of Fine Art (Musées Royaux des Beaux-Arts de Belgique) are at 3 Rue de la Régence and 1 Place Royale. There are collections of sculptures and paintings from the 15th and 16th centuries, from the 17th and 18th centuries (including one of the largest collections of Rubens paintings), from the 19th century, and from the 20th century. 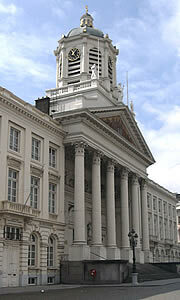 Opposite the church, on Rue de la Regence, is the Petit Sablon. This small park is surrounded by sculptures of different types of craftsmen, representing the different guilds. You can sit on a bench and enjoy the colourful flowerbeds, or the monument to Counts Egmont and Hoorn. They were two of the leaders of an unsuccessful fight for independence from Spanish rule. 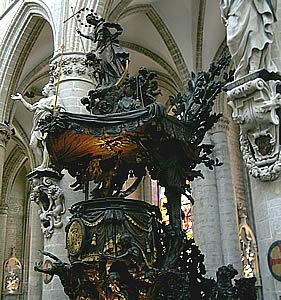 They were executed together in 1568 in the Grand' Place. On the slope behind the church is the Place du Grand Sablon. 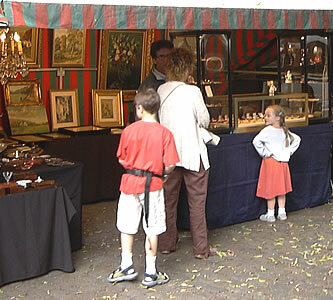 This is famous for the antique and book fair which is held here on Saturdays and Sundays. 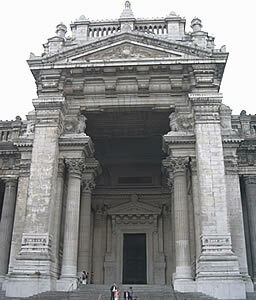 The Lawcourts (Palais de Justice) at Place Poelaert (Métro: Louise) were built between 1886 and 1893, during the rule of King Leopold the Second. Nearby there are two war memorials. 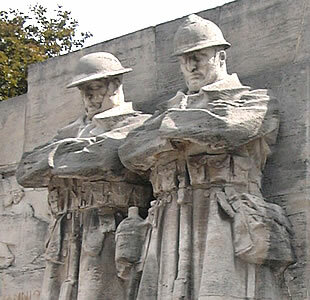 The larger one is for Belgian foot soldiers who died in the First World War (1914-18) and Second World War (1940-1945). The second is for the many British soldiers who died fighting in trenches in Belgium during the First World War. 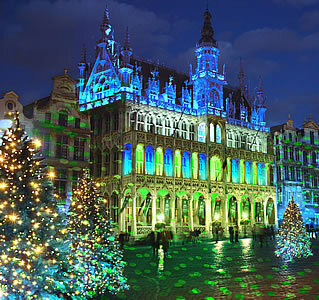 To book a ticket to fly to Brussels from a UK airport, see: Travel/Transport/Air.